Dartmoor is indeed a memorable plateau formed from granite, which sometimes obtrudes as tors, overlaid with peat. The highest tor is High Willhays, 2.039 feet but there are many others equally impressive. 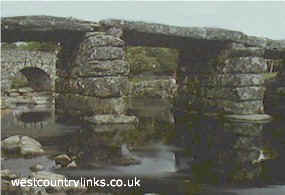 Among the most interesting features of Dartmoor are the thirteenth-century bridge at Postbridge, the eerie Cranmere Pool, remains of prehistoric settlements such as Grimspound. the stunted oak trees of Wistman’s Wood and, of course, the bleak prison at Princetown which was built at the start of the nineteenth century. The natural grandeur of Dartmoor contrasts markedly with the bright lights of some of Devon's holiday resorts visited on this tour. The scenery is varied, taking in picturesque ruined castles and engine houses desolate moorland. DARTMOOR’S small towns and villages are home to some of the best shops and pubs offering local produce and a true taste of Dartmoor. They form an integral part of community life on Dartmoor and, along with the village halls and churches, provide the focus for Dartmoor's residents. Read about a few of the moors towns and villages. Chagford is a thriving and welcoming little town that has a wealth of lovely shops supplying a range of local produce and is particularly well known for its two outstanding traditional hardware stores. The town also boasts the largest outdoor swimming pool in Devon set in idyllic surroundings in wooded countryside close to the river, where you can enjoy a swim or just sit and enjoy a drink or snack from the cafe. 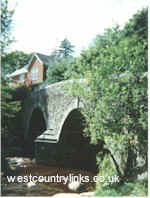 Christow situated on the slopes of the Teign Valley, is a traditional Dartmoor village with a wealth of mining history. The village has a small shop, a post office and the popular Artichoke Inn. Cornwood This is an excellent starting point for exploring the old farmsteads, and prehistoric and more recent tin mining remains that abound in the area. There is a village post office and tearooms. Dunsford Whitewashed thatched cottages huddle together above the wooded slopes of the River Teign. Both the post office stores and the Royal Oak public house are to be found at the centre of the village and just down the road is a children’s play area in the most idyllic setting behind the village hall. Drewsteignton The village church, shop and pub flank a central square in this attractive village. The village and its pub are named after a local family whose name can be traced back to 1210 in its original form ‘Drogo’. Hennock situated to the north west of Bovey Tracey, is a small village overlooking the Teign Valley. One particular gem is the Public House, also the Post Office. Holne This attractive village is one of the few Dartmoor settlements left with a working farm at its centre. Home Court Farm sells beef, Iamb and eggs direct to the public and supplies produce to its near neighbour, the Church House Inn. Horrabridge The village of Horrabridge lies along the A386 just outside Tavistock. Here you can admire the historic bridge dating back to 1260 while picnicking beside the River Tavy in Weir Park. There are also shops and two pubs to choose from. Lustleigh This picturesque village is tucked along the eastern foothills of Dartmoor. Savour lunch outside The Cleave pub next to the village cricket field. Mary Tavy It owes much of its character to history. At one time, the largest copper mine is Wheel Friendship, was on Mary Tavy. There is a post office shop, with a quirk in that the entrance is via the back door! Moretonhampstead is one of Dartmoor’s main centres for art with a thriving community of craftsmen artists, potters and blacksmith whose talents can be viewed in local studios as well as a prestigious gallery. A recent public art project has transformed the town with its life sculptures of Dartmoor ponies that children love to ride and a vibrant mosaic snail that wends it way towards the parish church. Princetown Lies at the heart of the National Park and is famous for HM Prison Dartmoor. Don’t miss the Prison Museum its fascinating history of prison life. Here, too, is the Dartmoor National Park Authority’s award wining High Moorland Visitor Centre, which is open throughout the year. The Tyrwhitt Trails give good insight into the history historic settlement and provide opportunities to explore the high moorland beyond. Locally brewed Jail Ale is sold in bottle at the Feathers and the Prince of Wales. Postbridge This hamlet is at the heart of the moor is so named because the bridge carried the first post road over the moor. There is a choice of two pubs and you can relax by the side of the river and enjoy a takeaway cream tea Post Office Stores. South Zeal This medieval new town, was created in the 13th Century by the Norman Lord, Robert de Tony. the village shop, The Stores, has expanded over the last few years and provides ample opportunity for retail therapy. The two village pubs in this attractive settlement offer the opportunity for relaxing meals. Sticklepath This was on a former major trade route during the industrial revolution but is now tucked away in the quiet corner of Dartmoor. A visit is worthwhile since, as well as the two pubs and local shop, the Finch Foundry museum will give you an insight into the village’s lively past. Widecombe in the Moor, World famous thanks to Tom Pearce, his grey mare the annual Widecombe Fair, which takes place on the second Tuesday of September. Widecombe has retained much of its unique character and is home to the ’Cathedral of the Moor’ the impressive Church of Saint Pancras that dominates the stunning views of the village from the surrounding moorland. Yelverton is rich in heritage and history as well as for it's range of shops and attractions. The area is known as Drakes Dartmoor because here you can follow in the footsteps of the greatest figures in history. Just outside the town is Buckland Abbey, previously home to the hero of the Armada, Sir Francis Drake. Today it is managed by the National Trust and is home to permanent exhibitions on his life work and exploits. On the moor, the River Dart divides into East and West. Sea trout fishing is good on the West dart, while brown trout can be taken on both rivers. Salmon fishing is best 3 miles upstream from Dartmeet.